The RCMP have made some arrests and are looking for other suspects in a major weapons and drugs bust in the Toronto area that has links to organized crime in the United States. Nine people were arrested across southwestern Ontario in a sweep that involved organized crime. They face 75 charges that include trafficking guns, tobacco and drugs including fentanyl and carfentanil, and bookmaking. 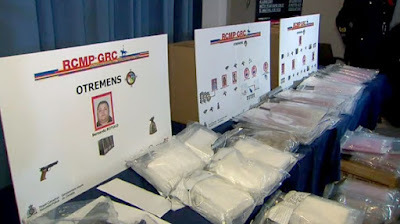 The investigation, dubbed Project Otremens, resulted in the seizure of six kilograms of fentanyl, 20 kilograms of cocaine and about 250,000 pills including methamphetamine, and 3 million contraband cigarettes. The FBI in New York City concluded a parallel, but separate investigation into La Cosa Nostra, focusing on members of the Bonanno and Gambino families. Arrested are: Domenico Paolo Violi of Hamilton, Dimitar Dimitrov of Stoney Creek, Adriano Valentino Scolieri of Richmond Hill, Bernardo Luke Rotolo of Woodbridge, Tran Giang Tang and Kam Tim Tong of Markham, Nicholas Valentine of Vaughan, Anthony James Arroyo of Waterloo, and James Lincoln Jablonski of Mississauga. 4 others have Canada-wide arrest warrants outstanding. Wojciech Grzesiowki, who is still at large, allegedly convinced Erin Manaran, a Toronto police civilian employee, to make “queries” of police databases for him and his organization. Toronto police allege Manaran accessed the databases in Feb. and Sept. of 2014. She was charged with two counts of breach of trust on July 20, 2016. The RCMP now says she is facing a total of 20 counts of breach of trust in relation to the illegal database searches.